Percutaneous fixation of the acetabulum is a treatment option for select acetabular fractures. Intra-operative fluoroscopy is required, and despite various described imaging strategies, it is debatable as to which combination of fluoroscopic views provides the most accurate and reliable assessment of screw position. Using five synthetic pelvic models, an experimental setup was created in which the anterior acetabular columns were instrumented with screws in five distinct trajectories. Five fluoroscopic images were obtained of each model (Pelvic Inlet, Obturator Oblique, Iliac Oblique, Obturator Oblique/Outlet, and Iliac Oblique/Outlet). The images were presented to 32 pelvic and acetabular orthopaedic surgeons, who were asked to draw two conclusions regarding screw position: (1) whether the screw was intra-articular and (2) whether the screw was intraosseous in its distal course through the bony corridor. 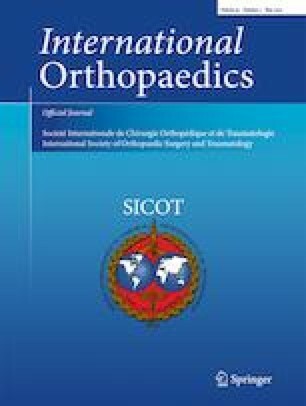 In the assessment of screw position relative to the hip joint, accuracy of surgeon’s response ranged from 52% (iliac oblique/outlet) to 88% (obturator oblique), with surgeon confidence in the interpretation ranging from 60% (pelvic inlet) to 93% (obturator oblique) (P < 0.0001). In the assessment of intraosseous position of the screw, accuracy of surgeon’s response ranged from 40% (obturator oblique/outlet) to 79% (iliac oblique/outlet), with surgeon confidence in the interpretation ranging from 66% (iliac oblique) to 88% (pelvic inlet) (P < 0.0001). The obturator oblique and obturator oblique/outlet views afforded the most accurate and reliable assessment of penetration into the hip joint, and intraosseous position of the screw was most accurately assessed with pelvic inlet and iliac oblique/outlet views.